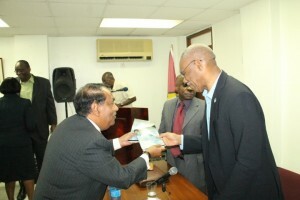 Ambassador to Kuwait, Sahmir Ally presenting a publication to President David Granger. Partly hidden is Foreign Affairs Minister, Carl Greenidge. The Alliance For Change (AFC) on Saturday fended off suggestions that Guyana’s Ambassador to Kuwait, Dr. Shamir Ally was unfit for that top diplomatic post, saying that he never deliberately engaged in fraud at an American transmitter manufacturer. The party for which Ally is a key financier said he had merely performed duties based on the system he had taken over. “The procedures he worked with he had inherited, and he operated under the close supervision of the CFO (Chief Financial Officer),” the AFC said in a statement. 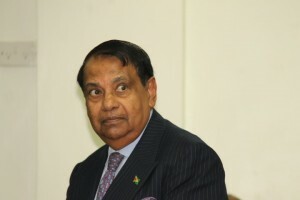 Even as Guyana’s Ministry of Foreign Affairs says it will be conducting a probe into Ally’s past, that political party also said that Ally’s July 2000 termination ruled out his ability to access the accounting records which would have enabled him to substantially rebut the SEC’s 2002 charge. The SEC states that Ally directed that unsupported journal entries be made to the cost of sales and inventory accounts to bring Acrodyne’s financial statements in line with the gross margin percentage he had estimated for period. The Commission claimed that Acrodyne’s former President and CEO, Robert Mancuso approved these fraudulent adjustments for the first quarter of 2000. The company’s President A. Robert Mancuso had asked Ally to help turn around the company as they were preparing to manufacture Digital Television Transmitters for Television Stations, converting from analogue to digital systems. However the AFC maintained that Dr. Ally also accused the SEC of making him a scapegoat since the Accounting procedures he had worked with he had inherited from his predecessors, and he has consistently iterated that he worked under the close supervision of Mr. Ronald Lanchoney, the CFO. That party’s leader, Khemraj Ramjattan has already expressed surprise that the information about Ally’s troubles before the United States’ Securities and Exchange Commission (SEC) had not been disclosed before the diplomat’s appointment. Ally said rather that going through a lengthy and costly trial, he and the other company officials had received legal advice to pay a US$10,000 fine without guilt. “We must reiterate that contrary to recent media reports, Dr. Shamir Ally was charged and required to pay a penalty by the SEC. He was not convicted of a crime,” the AFC added. The AFC says that Dr. Ally’s vehement denials of any culpability were first contained in correspondences to the Staff Attorney of the SEC’s Central Regional Office, Ms. Dawn Leporati Leget, on May 29, 2002. “His position today, fourteen years after the incident, remains unchanged. He insists that the company’s annual reports to the SEC were accurate financial results, gleaned from information available from the company’s accounting systems,” says the party which is in coalition with A Partnership for National Unity (APNU). The AFC explained that Acrodyne used to prepare quarterly reports based on some actual, and some estimated figures. But at year-end they did annual stock taking for end of year reports which were all audited and forwarded to the SEC. The Quarterly Reports to the SEC were not audited. That was Standard Operating Procedure at Acrodyne. There were also no highly computerized systems to offer closer evaluations from one year to the next. In all of his correspondences to the SEC and Acrodyne since 2002, Dr. Ally, according to the AFC, has said that he “most vehemently disagrees with the SEC’s charges”, and that he had agreed to pay the US$10,000 penalty under protest! The CFO also paid a US$10,000 penalty and the company’s President US$50,000. Ally was employed by Acrodyne, a public manufacturing company, for a short period, from February 2, 1999 to May 9, 1999 as the Cost Accounting Manager. On May 10, 1999 he was promoted to Controller and he served in this position for 15 months up to July 10, 2000. Dr. Ally was terminated in July 2000 when the Technical Director Ostroff became the new President. The company was at the time in the midst of a power struggle, falling revenue/income &a depleting labour force. Two years later in May 2002, the Securities and Exchange Commission (SEC), the United States agency for maintaining fair, orderly and efficient markets in-country, served notice on Acrodyne Pty. Ltd. and its former principals of its intention to take CIVIL ACTION. The charge read that the SEC was accusing former President A. Robert Mancuso and former Chief Financial Officer Ronald R. Lanchoney, along with Controller Shamir Ally, of disseminating false financial information in press releases and Commission filings in 1998, 1999 and 2000. Dr. Ally was first employed at Acrodyne in 1999. The AFC reiterated that contrary to information carried recently in several sections of the local media claiming that the SEC’s 2002 charges took away his voting rights in the USA, Dr. Ally has proven that the SEC’s final judgment (the US$10,000 penalty) never prohibited him from serving as an Officer or Director of any public company(as it did his erstwhile colleagues), neither did it rescind his voting rights. According to his political party, since 2002, Dr. Shamir Ally has continued to function unimpeded at very high levels in and out of the United States, voting at ALL National elections, City and Town elections. At Indian Trail, North Carolina, Dr. Shamir Ally was sworn in to serve on six Town Boards and Committees from 2014 to December 2015. More recently, in February 2015, the North Carolina Secretary of State appointed Dr. Shamir Ally as a Notary Public.